Here is almost every term used in the amusement industry and among enthusiasts to describe things regarding roller coasters and other thrill rides. 180-degree Inversion: Premier Rides’ term for a top hat – inside. 180-degree Roll: Element on Vekoma flying coasters where the riders turn from being in a face-down position to one which faces upwards, or vice-versa. 360-degree in-line roll: An in-line twist on a B&M flying coaster. 4th Dimension: Usually shortened to 4-D, this new type of coaster has unique seating which spin forwards and backwards independently to the direction of the train. The only model currently in existance is X at Six Flags Magic Mountain. Air Powered: Type of coaster where the train is fired from the station using compressed air, resulting in extremely rapid acceleration. Airtime: Also known as negative G’s. The sensation of leaving your seat, usually felt on the crests of hills and especially when riding the back of coasters. This is the feeling that most coaster enthusiasts generally look for in a roller coaster, especially a wooden one. Anti-Rollback Device: Safety feature which prevents the train sliding backwards down the lift hill or hills on the circuit. A metal wedge on the base of the car would grip onto grooved metal rails in the centre of the track should the train come to a stop on the hill. When the ride is operating normally, these wedges are what makes the clack-clack sound as the train ascends hills. Back-to-Back Seats: Feature on coaster cars where two pairs of seats are arranged so that whilst the front pair face forwards as normal, the rearward pair face backwards. Backwards: A coaster that travels the circuit backwards. Banked Turn: A very common type of track, where the track is tilted when turning, to reduce the lateral G’s experienced by the rider to an acceptable level. Barrel Roll: Another name for an in-line twist. Batwing: Two-inversion element where a diving loop leads directly into an Immelman. The two elements are a mirror image of one another, and the train exits the element parallel but opposite to it’s direction of entry. Arrow also use this term to describe a cobra roll on their sit-down coasters. Bench Seat: A seat with no central divider between the two seats. Bench: The Ride: A high-intensity thrill ride commonly found at many theme and amusement parks, as well as other locations, with multiple installations typically found in each location. Most seat 2-4 per installation and do not require restraints. Bent Cuban Eight: Type of inversion element which inverts riders twice. Block: A section of track that is separated from the rest of the track by brakes, chain lifts, or other devices capable of halting the train. Block Safety System: The term used to describe the safety system used on multi-train coasters, when one train is not allowed into a block until the train in front has cleared that block. Bobsled: A unique type of coaster without track – the ride instead consists of a U-shaped gully in which the train is free to travel of it’s own accord. Such coasters require very careful design to ensure the train doesn’t fly out of it’s gully when turning. Bogie: The chassis of a coaster car. Boomerang: This term has several meanings. It is the name given to a twin-inversion element where an Immelman leads directly into a diving loop. The train exits the element travelling parallel but opposite to it’s direction of entry. There are also numerous roller coasters with this name that have a boomerang inversion as the central element. Arrow call a batwing on their sit-down coasters a boomerang, whilst Vekoma use boomerang to describe a cobra roll on their sit-down and inverted coasters, as do Meisho on their sit-down rides. Booster Wheels: Tires located in the station, or on other parts of the track or lift hill, that propel the train forwards through flat sections of the circuit. Bowtie: An twin-inversion element where a diving loop leads into an Immelman. The train leaves the inversions travelling parallel to and in the same direction to that on entry. Brakeman: A rare type of coaster feature where the ride operator actually rides on the coaster train, and uses a lever to manually operate the brakes as the coaster travels the circuit, and to stop it when it returns to the station. Such coasters – generally old models – have no automatic brakes like those found on more modern rides. Brake Run: A section of track before a station, which contains brakes that are used to slow the train before it enters the station. Bunny Hops: A stretch of track containing two or more hills, each slightly smaller than the one before. These are smaller than camelbacks, and can generate good airtime. Butterfly: Inversion element which turns riders over twice, first in a sidewinder immediately followed by a diving loop. Camelback: Large hill, found on most hyper-coasters, which is mainly used to provide large doses of negative G’s. Also the term used by B&amp;M to describe a zero-G roll on their sit-down coasters. Capacity: Usually given in riders per hour, this is the maximum number of people that can pass through a ride in a set time. Most coasters, however, never perform at their full capacity, due to not all trains running and the time to load & unload the train. Car: The individual vehicle in which the rider travels. Several cars can be joined together to form a train. Catapult Launch: Used on coasters that do not have lift hills, this fires the coaster at a predetermined speed from the station. Centrifugal Force: Another term for lateral G-forces. Chain Dog: Located on the bogie, this is a small piece of metal which grabs the moving chain on the lift hill, and hauls the train up it. Chain Lift: This very common method of using a motorised chain to haul the train to the top of a hill, so that it may coast down the other side under it’s own momentum. Hence the term roller COASTER. Check Brake: Type of brake that is not usually active, but is part of the block safety system, and so can stop the train in an emergency. Circuit: A complete trip round a roller coaster track. Cliffhanger: Another name for a tilt coaster. Clothoid Loop: A vertical loop that is teardrop shaped. Cobra Loop or Cobra Roll: What a boomerang inversion element is called on B&M inverted coasters. Corkscrew: An inversion where a vertical loop has been stretched laterally, so the track resembles a corkscrew. Also (confusingly), the term used to describe an in-line twist that occurs on a Vekoma flying coaster, plus Pinfari’s term for a rollover on their inverted coasters. Corkscrew Hill: Despite it’s name, this is not an inversion element. The track twists 90 degrees as it ascends a steep hill, then twists another 90 degrees, in either the same or opposite direction, on the descent. Crossover: Where two parts of the same coaster’s track cross over one another. Cutback: Type of inversion element which features two half-corkscrews, but they are in opposite directions so the train leaves the inversion heading the opposite way to the one it was travelling on entering. Diving Loop: An inversion where the track inverts in half an in-line twist and then dives toward the ground in a half-vertical loop. Diving Turn: An inversion element consisting of a half in-line twist followed by a half-corkscrew. Dive Machine: Another name for a vertical drop coaster. Double Corkscrew: Two consecutive corkscrew inversions. Double Dip: A drop that has been separated by a short flat stretch of track. This gives good airtime in the rear of the train. Double Heartline Roll: Two consecutive heartline rolls. Double Loop: A coaster containing two vertical loops and no other inversions. Double Out & Back: A layout where the train travels from and returns to the area near the station twice. Double Sidewinder: Double Spiral Turn: Double Up: Where an upwards hill has been separated by a flat section of track. This gives good airtime in the front of the train. Double Wing Over: A double corkscrew on a B&M inverted coaster. Dual Track: A coaster that has two tracks. Usually racing, but not always. Duelling Coaster: Where the track design makes it appear two trains are heading directly for each other, similar to medieval jousting. Duelling Loops: Inversions on a duelling coaster, where two trains race towards each other, then enter two vertical loops which are set opposite one another. The effect is that the trains look to be on a collision course, but evade each other by entering their respective vertical loops. Enclosed: A ride that is totally under cover, or underground. Family: Mild coaster for whole families to enjoy. Fan Curve: A turn that the train enters ascending, but leaves descending. Figure 8: Where the track layout resembles the number 8. Fin Brake: Type of brake where a metal fin on the side or base of the car is gripped by calipers on the side or base of the track, and either stopping or slowing the train. First Drop: The first drop after the chain lift. Usually the highest and longest, but not always. Flat Spin: B&M’s name for a corkscrew on their sit-down and stand-up coasters. Flip: What B&M call a 180-degree roll. Floorless: Type of coaster from B&M where riders sit above the track, yet the cars have no floors. Think inverted roller coaster cars on top of conventional track. Fly-By: Feature on duelling coasters where two trains race towards each other, only for each one to swerve away at the last moment. Flying: A type of ride where the seats are tilted back, to give the feeling of flight. The track varies from inverted to conventional, so the rider is sometimes facing the sky and sometimes the ground. Flying Snake Dive: A diving loop on an Intamin rocket coaster. Flying Turns: Forerunner to bobsled coasters – concave troughs made from wood served as track, and low-slung trains raced down them. First introduced in the 1920’s. Flywheel Launch: Type of launch system found on steel Schwarzkopf shuttle coasters. A large metal flywheel rotates, and a clutch then engages this against a drum with a launch cable wrapped around it, which itself is connected to a pusher, which propels the train down the track to a preset speed. Freefall: This feature gives extended periods of negative G’s, and is found on shuttle coasters with vertical drops. Freeform: A type of coaster design unique to each ride, having depended on terrain, the ride designer and the wishes of the park. Giga-Coaster: The term Cedar Point coined to describe it’s Millennium Force – a roller coaster over 300 feet with no inversions. Hairpin Drop: A coaster that twists to one side and then drops almost vertically, with little lateral movement. Hairpin Turn: A sharp 180-degree turn. Half-Corkscrew: One half of a corkscrew inversion element. The two halves can be combined into a cutback or corkscrew inversion, or one half corkscrew can be combined with another element for a more complex inversion. Half-Loop: One half of a vertical loop inversion element. The two halves can be combined into a classic vertical loop, or one half loop can be combined with another element for a more complex inversion. Half-Roll: Only found on flying coasters, this element is used to turn the train from the flying position to one where the riders are facing the sky, or vice-versa. Head-Chopping: Where one section of track dives under another, or a separate object, to give the rider the illusion that they are about to be decapitated. Heartline Roll: Similar to an in-line twist, but the rider is rotated on a parallel about his/her heart. Heartline Spin: A zero-G roll on a B&M inverted coaster. Heart Loop: Another name for a rollover. Helix: Where the track turns and either ascends or descends simultaneously. 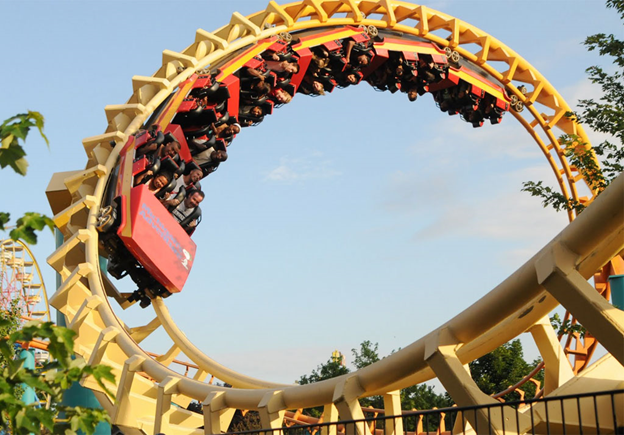 Horsecollar: A common type of restraint on coasters with inversions, which pulls down over the head of the rider and locks in position over the chest. Hydraulic Launch: Propulsion system used on Intamin rocket/accelerator coasters. Hypercoaster: A coaster with a height over 200 feet. Inclined Loop: An inversion where a vertical loop is tilted, about a pivoting point on the ground below it. Inclined Dive Loop: Where a diving loop is tilted about a pivoting point on the ground below it. Immelman: Inversion element where half a vertical loop is followed by half an in-line twist, meaning the train has completed one inversion and travels in the opposite direction exiting the element to that when it entered. Named after a World War II stunt plane maneuver. In-Line Twist: Type of inversion where the train is rotated about it’s own axis, so the direction and elevation do not change. Interlocking Corkscrews: Where two separate corkscrews are interlocked. Despite being next to each other, the two inversions are not taken consecutively. Interlocking Flat Spins: Where two flat spins interlock on a B&M sit-down coaster. Interlocking Loops: Where two vertical loops are interlocked. This makes for an exciting ride if two trains are timed to travel over the loops at the same time. Interlocking Wingovers: Where two wingovers interlock on a B&M inverted coaster. Inversion: A part of the track where the rider is turned upside down. Do not confuse with inverted. Inverted: A coaster where the train rides below the track, and cannot swing in relation to the track. These coasters can contain inversions, but do not confuse with them. Compare this with a suspended coaster. Invertigo: An inverted roller coaster with the same track layout as a Boomerang – i.e. three forward inversions, three backward. Junior: A coaster designed for children. Kiddie: A coaster designed for very small children. Lapbar: A common type of restraint, which locks in place over the riders lap to prevent them leaving the car while in motion. Lateral G’s: The forces of gravity that propel the rider to the outside of turns. Greatly reduced by banked turns. Lift Hill: The track, usually at the start of a ride, which raises the coaster. Usually a chain lift is used, but they can also be tyre-driven. LIM Launch: Linear Induction Motor. Where the train is propelled up a lift hill or along a section of track using magnetic waves. Loading Platform: The part of the station where the rider boards the train. Looping Revolution: A zero-G roll on an Intamin inverted coaster. Looping Spiral: A corkscrew on an Intamin stand-up coaster. LSM Launch: Linear Synchronous Motor. Similar to LIM Launch, magnets are used to propel a train along a track giving it the necessary momentum to complete the circuit. Manual Brake: Type of brake found on old coasters, where the operator pulls a lever to stop the train as it enters the station. Mine Cars: Cars themed as mine trucks, used on mine train and some wild mouse-design coasters. Mine Train: A coaster that simulates a ride through an old mine, usually with theming. Mobius: A rare coaster layout where two trains race each other on parallel tracks, but each train arrives on the opposite station to which it left. Motorbike: Type of coaster from Vekoma, where riders straddle seats as if they are riding a motorbike. Mouse Cars: Cars themed as mice, used on Wild Mouse coasters. Multi-Element: A coaster that contains more than one type of inversion. Multi-Lift: A coaster with more than 2 lifts. Multi-Track: A coaster with more than 2 tracks, usually racing. Negative G’s: The G-force that causes airtime. Oblique Loop: Despite it’s name, this isn’t an inversion. Instead, it is an element on B&M coasters when two inclined portions of parallel track are joined at their crests by a banked turn. Partially Enclosed: Where the track is partly indoor/underground and partly outdoor. Pay-By-Ride: Where the rider pays for each ride/attraction separately. Pay-One-Price: Where one entry fee gains admission to all of a park’s rides and attractions. Pipeline: An as-yet unopened type of coaster, developed by Arrow and similar to a heartline. Positive G’s: These pull the rider into the seat, usually at the base of hills and during inversions. Powered: A coaster which is powered throughut all or part of the circuit. Some enthusiasts do not regard these as proper roller coasters as they lack the ability to coast throughout their full length. Pretzel Loop: Element found on some B&M flying coasters. Racing: Where two or more trains race each other around the circuit. Restraint: Prevents the rider from leaving their seat during the ride. Seatbelt, lapbars and horsecollars are all types of restraint. Revolution: An in-line twist on an Intamin inverted coaster or a zero-G roll on an Intamin stand-up coaster. Road Wheel: The wheel on the base of the car that rides on top of the track. Rollover: Inversion element on Vekoma SLC coasters, which turns riders over twice. An Immelman leads directly into a diving loop, and because of the positioning of the two elements, the train ends up travelling parallel and in the same direction leaving the element as it was on entering. Rotating Seats: New feature found on Arrow’s 4th dimension coasters. Instead of riding above the track, the seats are at the side of a 20-foot wide vehicle which straddles the track, meaning that the seats rotate 360 degrees as they travel the circuit. Scarf Brake: Type of brake which can slow a train down, but not stop it. Screw: A corkscrew on an Intamin sit-down coaster. Seat: The position where the rider sits (or stands) during the ride. Sea Serpent: Term used for a bowtie inversion on a B&M coaster. Seatbelt: A type of restraint, usually similar to lap belts in cars. Shuttle: A coaster layout where the train travels the same length of track twice, generally once forwards and once backwards. Side Friction: A coaster that has no up-stop wheels and requires careful design to prevent the cars leaving the track. Side Friction Wheels: These prevent the train from leaving the track sideways. Sidewinder: One half of a Boomerang inversion, where the train is inverted and turned 90 degrees, relative to the direction of entry. Single Cars: Where the cars travel the circuit individually, and aren’t joined together as a train. Single Loop: A coaster where one vertical loop is the only inversion. Single Out & Back: The train leaves the lift hill, travels to a turnaround and returns to the station. Single-Rail: A type of coaster where the track comprises of one tubular rail, as opposed to two rails found on most other coasters. Skid Brake: Old type of brake where the train wheels are lifted off the track by fixed wooden bars. Friction between these and the base of the cars then slows the train. Speed Bump: A small hill taken at high speed, usually to deliver airtime to the riders. Speed Run: Several speed bumps in succession. Spin: In-line twist on Vekoma inverted coasters. Spinning Cars: The cars spin whilst travelling around all or part of the circuit. Spiral: What a corkscrew is called when found on an Intamin inverted coaster. It is also the term used by Zamperla to describe a heartline roll on their flying coasters. Spiral Coaster: Type of coaster from Intamin similar to the prototype Arrow Pipeline. Currently only one model exists, at the Al Sha-Ab Lesiure Park in Kuwait. Spiral Lift: A coaster lift hill that ascends in a spiral pattern. Usually found on small-to-medium coasters, and generally used to save space. Spiral Turn: A corkscrew on a Giovanola inverted coaster. Slingshot: A type of thrill ride where patrons sit in a two-person capsule, which is fired upwards at a high rate of speed using elasticated ropes suspended between two poles. Standing But Not Operating: Usually abbreviated to SBNO. A coaster that isn’t operating, but hasn’t yet been demolished. Stall: Term used when a coaster fails to complete it’s circuit, usually by failing to clear a hill, inversion, or high zone, and gets stuck part-way around. Stand-Up: The rider stands instead of sitting down. Station: Where the rider boards the train. Spare trains and the operator’s controls are also usually located here. Station Brake: The main brake used to stop the train at the end of the ride. Steel: The track is comprised of steel. Steel Structure: The ride has a steel structure, but not necessarily a steel track. Storage Track: Track section away from the main circuit where the trains are stored when the coaster isn’t operating. Straight: A coaster that has no turns in its track. Most shuttles are like this. S-Turn: Simple track maneuver which is used on suspended coasters to swing the cars first one way, then the other. Suspended: The train rides below the track. The cars swing in relation to the track, and cannot contain inversions. Compare this with inverted. Suspended Looping: Vekoma’s name for their inverted coasters, just to keep things confusing. Swing Coaster: Another name for a suspended coaster. Switchback Railway: The precursor to wooden coasters. A car would descend a slope, and after travelling up the other side, an operator would transfer it to a parallel track. It would then traverse this parallel track to it’s original starting point, where it would be transferred onto it’s first track – these transfers were known as switchbacks. Terrain: Use of natural terrain features prominently in the ride. Themed: A coaster that has a special layout, effects, buildings, lighting, graphics or sound to create a particular theme to the ride. Threaded Loop: A vertical loop which has a section of track from either the same ride or a different one passing through it. Tilt Coaster: A new type of coaster where the train is pulled onto a horizontal section of track, and secured firmly by a hook and a steel block. The track section then tilts, becomes vertical, and the train is released when the track lines up with a fixed section below. The only current example of this ride is Gravity Max at Discovery World in Taiwan. Top Hat: Track section which travels vertically upwards, curves over an apex then descends vertically downwards. Top Hat – Inside: The track has the same layout as a top hat, but the train travels on the inside of the structure, meaning it inverts at the apex therefore turning the riders upside down. Track: What the train travels on. Train: At least two cars connected together. Transfer Track: Track section that moves to enable trains to be placed from the circuit onto the storage track, or vice-versa. Transportable (Portable): The coaster is transportable and tours different locations throughout the year. Trick Track: Element on wooden coasters from the 1920’s where a section of track was crooked in order to fool riders into which way they were going to turn. Also called “jazz track”. Trim Brake: A brake at some point on the circuit used to slow the train to an acceptable speed, or to protect the riders from excessive G’s. However, some coasters are over-braked and made less exciting. Trim brakes cannot completely stop a train; compare with mid-course brake. Triple Loop: A coaster that contains 3 vertical loops as it’s only inversions. Triple Out & Back: A layout where the train leaves and returns to the area near the station three times. Turnaround: Where the track turns round at a point furthest from the station. Turnover: What Arrow call a 180-degree roll. Twist and Dive: A diving loop on a Togo sit-down coaster. Twister: A coaster layout with numerous twists and turns in all directions. Two Lifts (Double Lift): A coaster with 2 lift hills. Two Stations: A coaster with 2 stations. This speeds up the loading/unloading and helps reduce queue times. Two Tracks: A coaster with 2 separate tracks, which usually run parallel or adjacent to each other enabling trains to race or duel. Tyre-Drive (Tire-Drive) Lift Hill: Where rotating tyres are used to propel the train up the lift hill instead of a chain lift. Up-Stop Wheels: Wheels on the underside of the train to prevent it from leaving the track on the crests of hills and during inversions. Valleying: (aka “Rollback&quot Term used when a coaster fails to complete it’s circuit, and gets stuck part-way around. “Rollback” or “stall” are more accurate and accepted terms in the amusement industry, however. Vertical Ascent: A ride containing a 90 degree vertical ascent. Vertical Drop: A ride containing a 90-degree vertical drop. Vertical Lift: A rare feature where instead of a lift hill, a coaster car/train is lifted vertically upwards on a section of track that acts as a lift. When this section is aligned with the rest of the circuit at the top, the car/train moves forwards to complete the ride. Vertical Loop: The rider turns totally upside down in a 360-degree circle. Water Coaster: A ride that has conventional steel track, but small 10 or 12 passenger boats as the cars. The ride travels and drops through water similar to a log flume at several points during the ride. Weight Drop Launch: Propulsion system found on some Schwarzkopf shuttle coasters. A large weight is concealed below one of the track support columns forward of the vertical loop. This is dropped down a shaft, and a series of clutches and cables operate a pusher behind the train, which propels the train down the track to a preset speed. Wild Mouse: Coaster type featuring sharp drops, sudden turns and single cars. Wing Over: B&M term for a corkscrew on their inverted coasters. Wood: The track is comprised from wood. Wood Structure: The ride has a wood structure, but not necessarily a wood track. Wraparound Loop: Inversion element on inverted coasters that is similar to an Immelman. A half-loop twists to the side at it’s peak, and the track then enters a helix which twists down to the ground. X-Rail: Also known as 4-D rails. The secondary rails on a 4-D coaster track responsible for telling the trains which way to spin the seats. Zero-G Roll: Similar to a heartline roll, but the track turns up and down during the inversion. This gives plenty of negative G’s. Zero-G Heart Roll: A heartline roll on Intamin inverted and sit-down coasters. Special Thanks to Andrew Rathe for providing the initial copy of the glossary.